Somehow, when I play this extremely intense tactical game, I think of Mr. Bean. I was never a fan of his take on comedy, but the ridiculous situations I often create for my men can either infuse bursts of laughter or a hysterical fury. I was fairly skeptical of Door Kickers when I first heard about the game. So, there is another top-down shooter in the debris of the mobile app stores, this time with the Police. I haven’t played the PC version, but something about the user reviews on Google Play stirred my curiosity. Now, I am ready to share my impressions with those who are still on the fence about purchasing the $5 premium game. If you watch the trailer, you might get all sorts of impressions – the neatly clad gunmen in the uniform kick the doors and burst into the thugs’ liars, taking them down in batches. In the gameplay trailers, it all looks so chic, coordinated and streamlined I though this was going to be a moderately light experience on my brain cells. I was anticipating a laid-back shooting experience from the likes of Killing Floor Calamity or Unkilled. I was wrong. Every time I play the Door Kickers my ego is deeply hurt, and I am glad I don’t really have to post a video of my goofy attempts at coolness. This game is rad. I have learned to take it lightly, though, with a good dose of humor, but still prefer to play it in seclusion. First of all, because the game requires 100% of my attention. Second of all, because I might indulge in yelling, weeping and sometimes swearing. 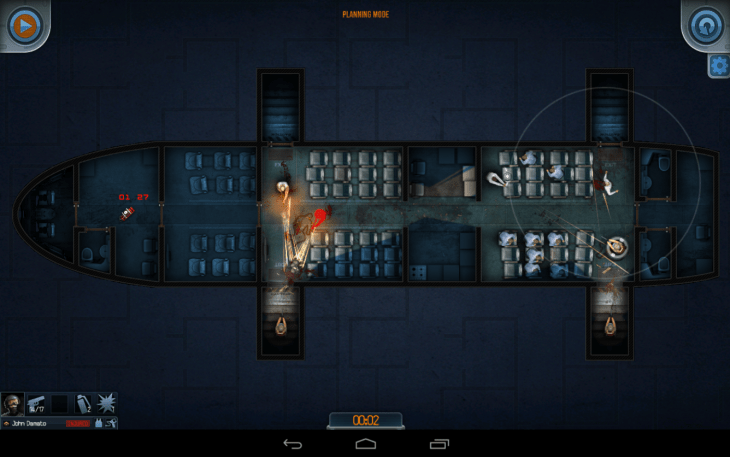 Door Kickers is a mish-mash of several genres. It’s a top-down shooter, puzzle, tactical SWAT command. However, it is a puzzle in the first place, a tactical game in the second, and only then it’s a shooter. In other words, it only treads lightly on the surface of the typical shooters we are used to on mobile. The gameplay reminds me of a movie making, or at least my idea of what movie making is. You have a location with a top down view, and 2-4 police officers. The criminals are either inside, or outside, so you know the entire area of the map needs to be cleared. The catch is – you don’t see where they are until you lead your men inside. The entire map is a dark zone until your men cover it bit by bit. Your objective is to kill the thugs, save the hostages if any, or deactivate a bomb, or take an item – you know, the basic and extended set of SWAT operations. 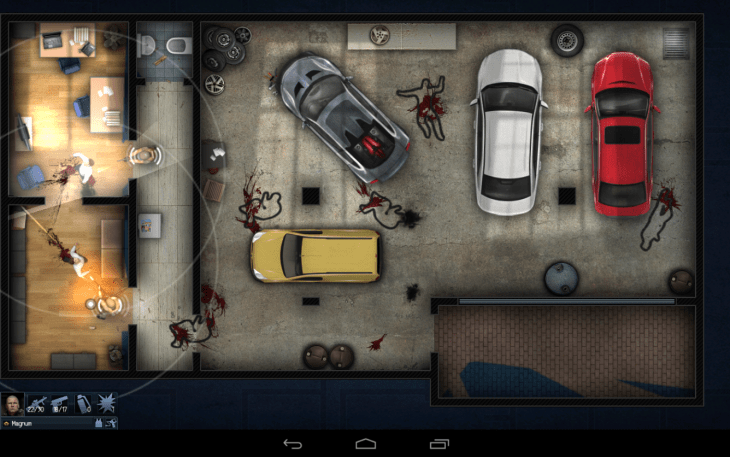 The locations usually have several areas, like rooms or structures, that provide the bad guys with plenty of room for maneuvering and plenty of objects to use for cover. Hence, you will need to position your men and move them so that they don’t get under heavy fire, but take out the thugs instead. You can do so in two modes that switch instantaneously – the planning mode and the playing mode. The fact that you started out in the planning mode does not mean you have to continue with it. You can just switch to playing and act depending on the situation. This liberty creates a multitude of play styles. The planning mode lets you create a “script” for your men. Tap on a soldier and draw a line where you want him to move. 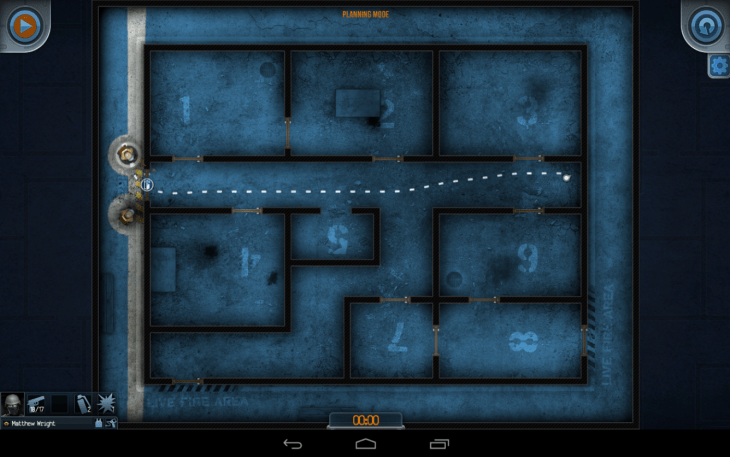 Then tap on the destination and choose an ability to deploy – a grenade, a door kicking burst, or a stealth sneak peek through the key hole. Each character has a class-based set of skills, more on that later. Once you think you have planned a perfect assault operation, you can hit Play at the top left corner and watch your men act on your orders. The other way of playing is in real time, with the play button on. That way, you direct your men and they follow you instantly. Yet another way is to combine the two, which in many cases proves to be the faster and the more efficient way of adjusting your tactic to the ever changing situation. 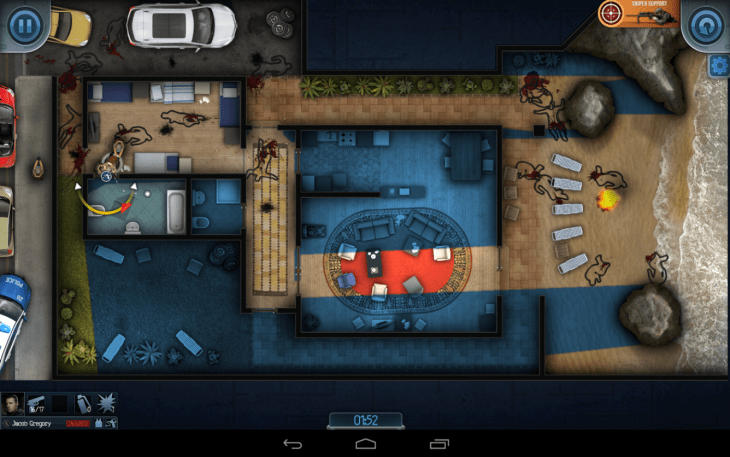 You move in, see the targets and pause to make a few adjustments to the commands, then hit play again and so on. The tactical part of Door Kickers is tricky. You can’t just die a dozen times learning the locations of all the bad guys on a map – they are random with each replay. I feel my left eye twitching as I write this because the randomly generated thugs locations on the map with each replay means you learn nothing from a failure. The moment you think you have mounted a flawless ambush, the game destroys you with the thugs with automatic machine guns coming from the places you least expected them to. That is both frustrating and good. This is how you learn something from the real life situations, may we never face them in real life. The main mechanic in Door Kickers is choosing the right angles, in my modest opinion. In fact, it’s all about the angles. Choosing the right entry angle to have at least half the room in the vision for one man, and then choosing the perfect entry angle for his partner to have the dark zone immediately sliced as a pie and covered simultaneously. Otherwise, you lose men. Did I say when your men storm in, the first bad guy in line will alert the others with “They’re here!” You lose the surprise element, and the criminals are now plotting an ambush. Door Kickers is an unforgivably hard game, and it has no tutorial as such. 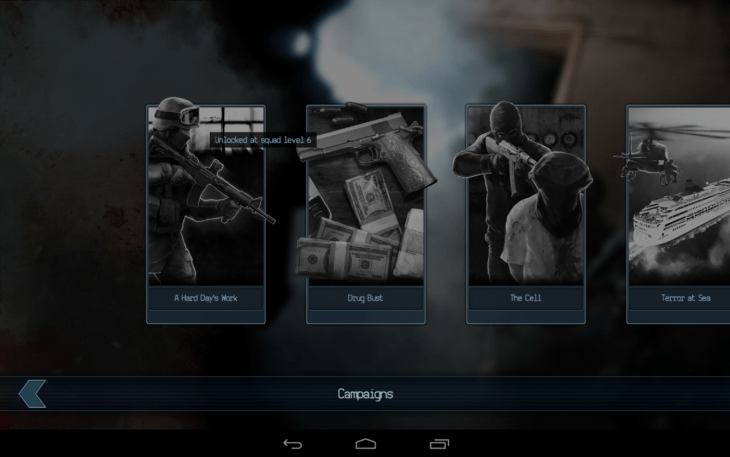 It has the single missions, the mission generator and the campaign. The latter is unavailable until your squad reaches level 5. So, until that happens you are playing the approximately 80 maps of the standalone single missions, which in fact feel like a tutorial. 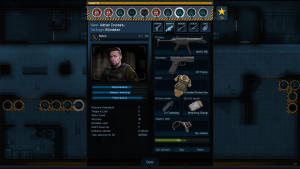 The single missions introduce the ever growing list of mechanics and features, allowing the players to learn and progress at their own pace. It totally makes sense because each mission comes with a little help menu that explains the newly introduced mechanic, and you can view it at any time. I see no other way of introducing that load of new information to the player without overwhelming him or her. Notably, you are not locked out of single missions if you get stuck on any of them. If some map is excruciatingly hard, you can just go to the menu and choose a different one. You don’t need to cover them one by one, which is fun. As you complete the single missions, your squad earns stars (1-3 as usual) and based on the time you spent on a mission, the number of men you deployed and the number of men you lost, as well as the weapons you used, you are awarded the stars and XP. So, your squad levels up. 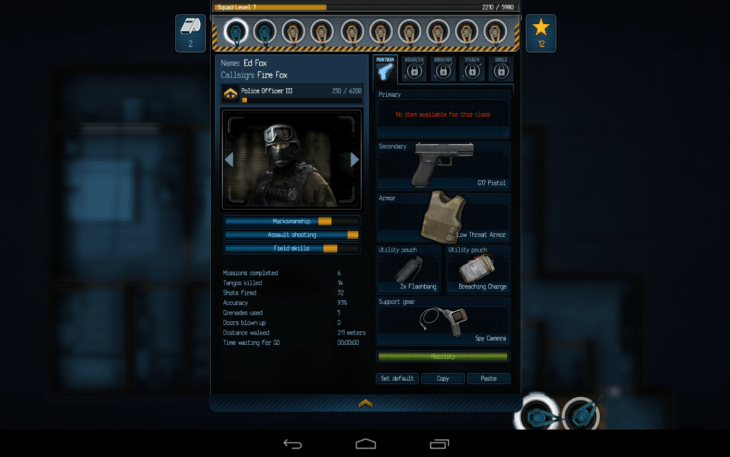 With that comes the unlockable content – over 65 weapons and gear items. Micromanagement is not my favorite element in any game, and truth be told I was a little frustrated when I saw how Door Kickers lets you manage your squad, sort and equip their gear and weapons, and the grinding for the doctrine points. I was saddened partly because the character and weapons management window is fairly difficult to sort out at the beginning. On the flip side, I imagine any devoted player enjoying the process. Pointman wields a 1911 pistol, moves fast and is the perfect door kicker. He is good at close to mid-range shooting, covers angles fast and interacts with objects without losing accuracy. Assaulter wields primary and secondary weapon, by default M4 carbine and G17 pistol, and hence is better at taking down long-range targets. Good fighters. Breacher wields pump action shotgun and G17 pistol, and unlike the Pointman, the Breacher does not take setup time before kicking the doors. Stealth and Shield are the two units some players say are the least used, but I think it just takes a few weeks of heavy gaming to wrap your head around the sophisticated tactics involving these units.b Stealth wields a suppressed MP5SD3 submachinegun and a P226 pistol, and can eliminate the bad guys without alerting the rest. Shield units have M&P .40 pistol and a ballistic shield, so he can move head on to the bad guys always and if his flanks are covered. On the downside, his accuracy is not stellar. I would not say the micromanagement part in Door Kickers is very enjoyable due to the way the character window makes it somewhat hard to tell the difference between the units, but practice makes perfect. You also face some heavy grinding for decent gear and weapons because the default ones are quite outdated. However, since there are no IAPs, you just grind as you earn experience. 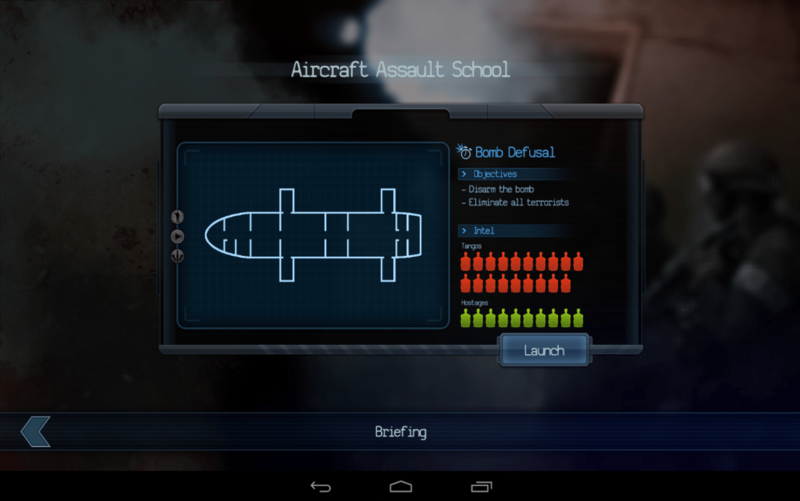 So, the overall impression is that of a military training with a digital sim. Tons. 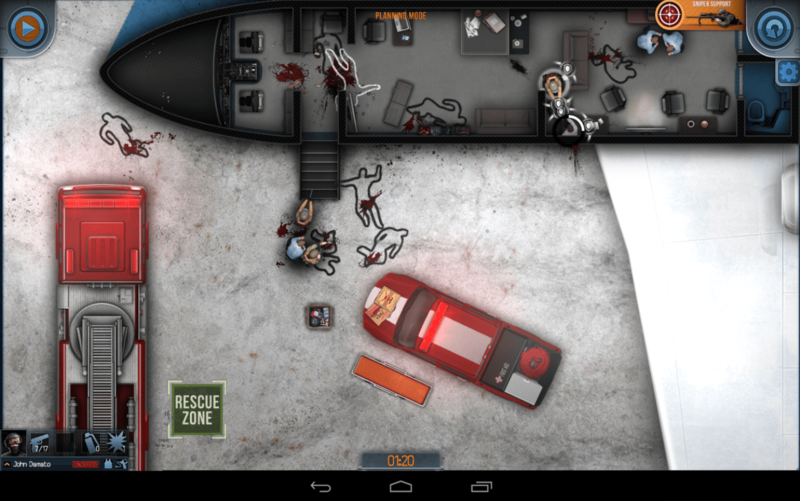 Door Kickers offers literally tons of replay value, let alone the sheer mass of the missions and the campaign chapters. Some missions will have you play for hours, even days, until you clear them. You can skip the hard missions and go on with the others, but you will still want to beat the beast. Provided the thugs are located in different zones with each replay, what you think you have learned from a map dwindles down to nothing. 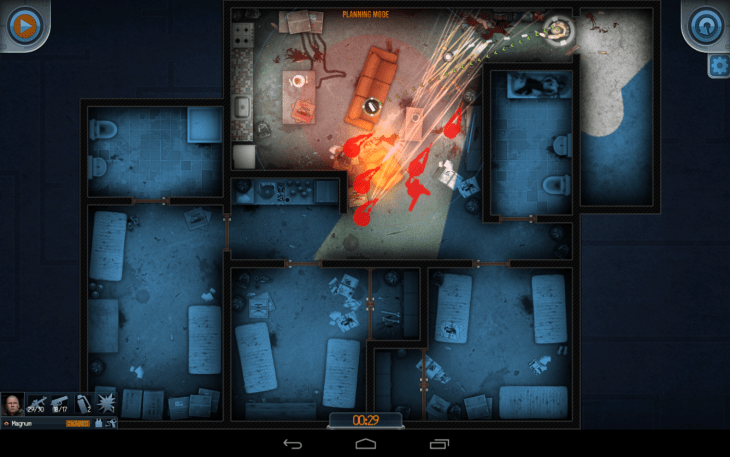 Door Kickers offers by far the most entertaining replay value due to this randomness, although it may cost you a couple of prematurely gray hair. At the same time, this unapologetic difficulty and randomness impose a serious restriction on how you can play the game. I found myself incapable of focusing on the tactical and stealth action while on the go, or listening to the news broadcast, or watching Fear The Walking Dead. No go. This game requires all your attention and a comfy play zone, where no one can kick your elbow and mess a move. Remember, your fingers are responsible for your men’s lives. Thankfully, the game lets you play offline. 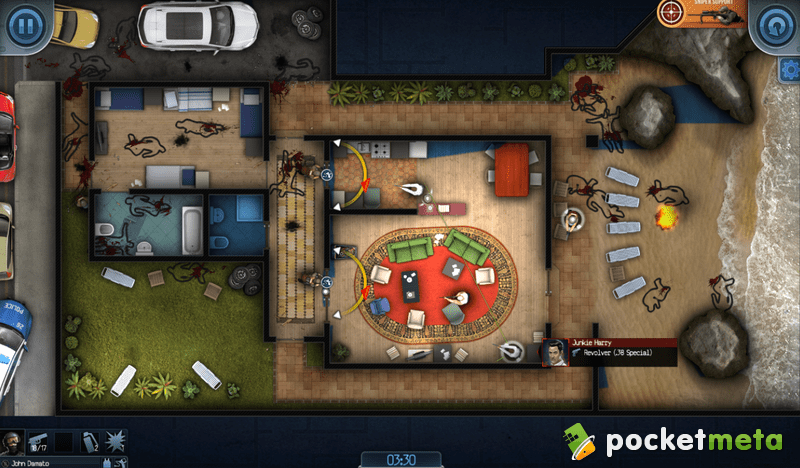 Door Kickers sports an eye-pleasing 2D design, with soft colors and detailed objects rendering. I loved the textures and the renditions, especially how they reflect the accuracy of the movement and aiming. In a way, this game is somewhat reminiscent of Mediocre’s Does Not Commute in style, which is a good thing, as far as I am concerned. Even though the eye candy is not central to the gameplay here, it is still a very decent and solid work. The music and the Police comms sound score create the appropriate tense atmosphere that is never distracting. UI, unlike the looks, takes a central part in the gameplay because every option needs to be immediately accessible, and the developers have succeeded in squeezing in the loads of features into the mobile port without overloading the UI. Overall, the controls are fluid and the UI is intuitive, with one little nag in the character and weapon micromanagement window, which could probably use a contrasting light background. Sometimes, I struggle with turning a man in the direction I need, or end up throwing a grenade into a closed door, which mostly comes from not paying attention to small things like which mode I am playing in. Without a doubt, this is a game that requires a lot of practice and diligence on the player’s part, but the whole process is incredibly enjoyable. Besides, we see the unique mechanics that add loads of novelty to the tired genre. 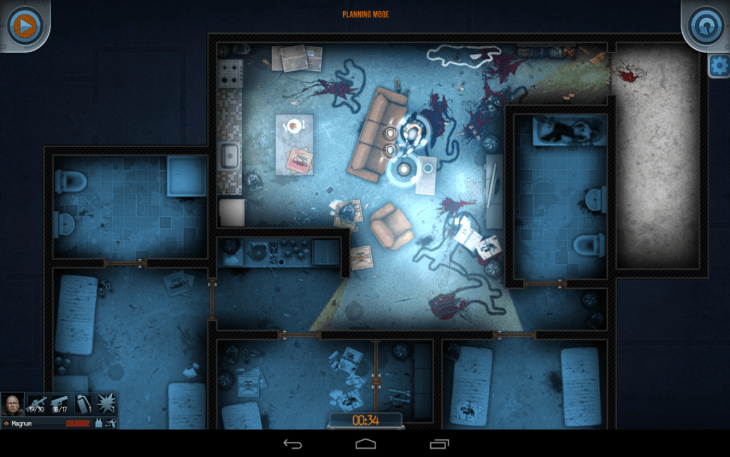 Door Kickers is without a shadow of a doubt worth its price, and even more. It’s not a con per se, but it could be a tad easier to unlock the weapons. You know, for the dummies. I eagerly anticipate Door Kickers becoming the legend of tactical shooters on mobile. It’s one of the best games this year, and even though 2D may seem outdated to many players, the looks are by far not the most important item on the list of its virtues. My favorite feature of this game is the freedom in planning and the play style it grants its players. It’s the novelty and uniqueness of the gameplay mechanics that got me befuddled at first and totally sold later. With the absence of a tutorial, I tried to figure out not only how to play, but also what this game was all about. Is it a turn-based strategy? A puzzle? Or a real-time shooter? And then it dawned on me – it’s all of those things, and I can play it my way, at my pace, my style. I can plan in small intervals and play semi-real-time, pausing to adjust my moves to the situation. I can go all-in with planning an ingenious ambush and executing it without a pause, or on the contrary, go wild and do the live mission Chuck Norris style without planning. And the game rewards the player for experimenting. 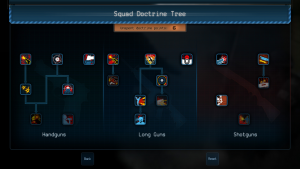 The RPG style squad management and leveling up will see you earning doctrine points to buy new gear and weapons, which does feel like hard grinding at times, but you will get better with practice, so the grinding subsides. The sheer mass of the content available in the game is topped by the missions generator and the unprecedented replay value. I can’t recommend it more. 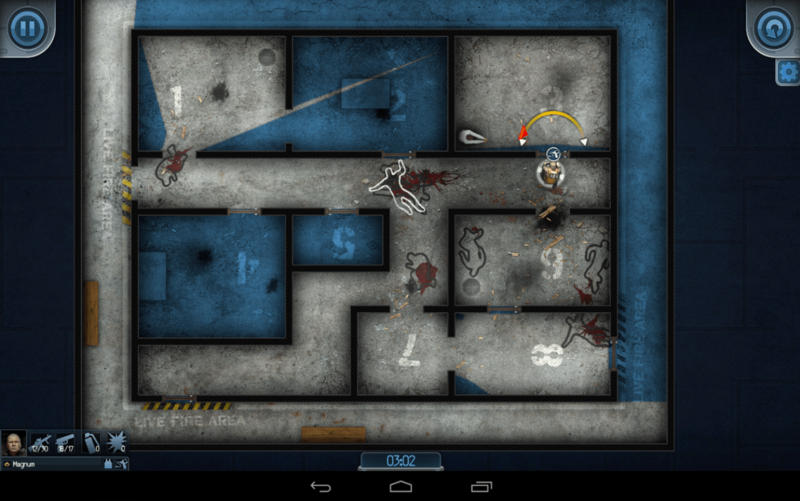 I eagerly anticipate Door Kickers becoming the legend of tactical shooters on mobile. It's one of the best games this year.